Ultrabond ECO® 810 is a quick drying professional grade carpet tile and fiberglass-reinforced vinyl sheet adhesive used for permanent or releasable installations. Install while Ultrabond Eco® is wet for permanent bonding or while it is in the tacky phase for releasable installations. Great for interior residential, commercial, and institutional applications. For installation of vinyl-backed tile, solid vinyl tile, carpet tile, and carpet under cushion pads in a double glue-down application. Also for use with fiberglass-reinforced vinyl sheet flooring. Suitable for use over fresh concrete slabs with diminishing moisture vapor emissions rates (MVERs) up to 8 lbs. per 1,000 sq.ft. per 24 hours and 90% relative humidity. Installation of flooring while Ultrabond Eco® is wet will result in a permanent bond. 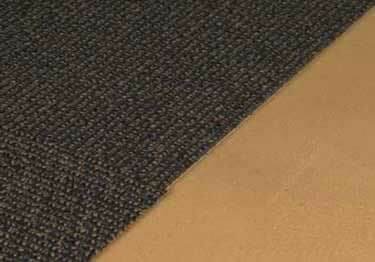 Installation of flooring once Ultrabond Eco® has become tacky will result in a releasable bond. For installation of vinyl-backed tile, solid vinyl tile, carpet tile, and carpet under cushion pads in a double glue-down application. Do not install over any substrate containing asbestos. Suitable Substrates: exterior grade plywood (Group 1, CC type); approved wood underlayment (see manufacturer details); concrete and properly prepared cement terrazzo; cement-based self-leveling underlayments and patching compounds; embossing levelers applied over existing properly prepared and fully bonded ceramic tile and sheet vinyl; single layer and properly prepared fully bonded vinyl composition tile (VCT); primed and properly prepared gypsum underlayments thate meet the requirements for compressive strength per ASTM F2419; and properly prepared PlanisealTM EMB epoxy moisture barrier.